Lauri Hyvärinen is a guitar player from Helsinki, Finland. 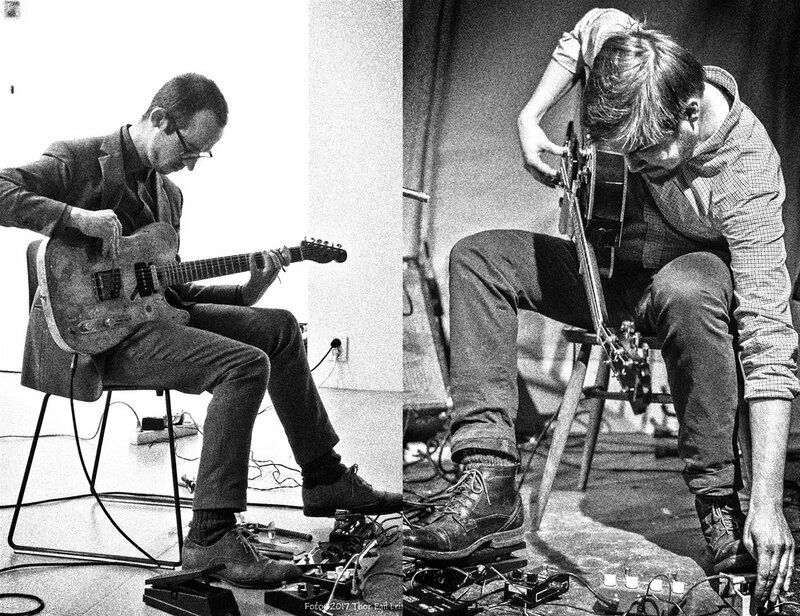 For most of his life he has concentrated on experimental and improvised music as well as noise. He works to find a balance between an instrumental impulse and a respect for silence and presence. Besides his solo ventures Hyvärinen has played with musicians such as Ilia Belorukov, Tommi Keränen, Jone Takamäki, Alan Wilkinson, Jack Wright, Morishige Yasumune and Naoto Yamagishi. Hyvärinen has performed in Europe, Japan, Russia and the Baltics. Nicola Hein is mainly concerned with the search for new sounds on his instrument, the guitar. He plays electric and acoustic guitar with or without preparations and tries to find new ways of playing the guitar within the context of Free Improvised Music and Jazz. He plays the guitar with his hands and plectrum but also with a lot of different objects: screws, rulers, iron wool, violin bow, abrasive paper, magnets and many other objects which are part of his musical vocabulary. The result is his very own world of sounds, which is using the rich potential of the guitar as a creator of sounds. The manual creation is a very important character of this sound world, which never gets distorted by the use of electronic effects. As a composer he finds different ways of integrating philosophical ideas into music and to play music as a form of philosophy. In order to actualize itself the compositional work is always aimed at the improvising musician as a dialectic partner of the composition. From the interplay of these partners an esthetic emerges that is based on the spontaneity of the performance and the setting of aesthetic action spaces alike. Ami Yamasaki is a vocalist and multimedia artist from Tokyo. Her work is diverse and prolific, creating installations, performances, and films in a variety of settings, most recently as part of the performance “Sounds to Summon the Japanese Gods” at the Japan Society of New York. Solo performances include “Signs of Voices” (2016, Kyoto Art Center, Japan), “Voice, Boundary, Gravity”(2017, Cathy Weis Project),“Experimental Intermedia 2017”(played with Yasunao Tone, curated by Phill Niblock). She has participated in numerous group shows, including “Tokyo Experimental Festival 9” (2014, Tokyo Wonder Site, Japan), “Exchange-planting a seed” (2013, Aomori Contemporary Art center, Japan) and “Sonic City 2013 Liquid Architecture” (2013, RMIT, Melbourne, Australia). She frequently collaborates, working with Keiji Haino, Ryuichi Sakamoto, and Yasunao Tone. She has lead workshops at The National Museum of Art, Osaka, Japan, Arts Maebashi, and Sapporo City Kojo School, as well as a variety of television and film appearances, including narration and voice for “MORIBITO Ⅱ” (NHK, 2017) and Hayao Miyazaki’s latest short film (Ghibli, 2017). She presented at TEDx Tokyo in 2016.In 2017 she was an Asian Cultural Council fellow based in New York City. In 2018 she is a residence artist at RhizomeDC in Washington DC and Asian Fellow of Asia Center of Japan Foundation in Philippines.